At 130 dB, Pocket Guardian is loud. It can be activated in two ways. First, by pulling out the pin, which is connected to the keychain. The alarm will continue until you push the pin back down into the alarm body. Second, by pressing the small button on the side with the alarm symbol. The keyring can be attached to your purse or backpack strap, making it easily accessible. 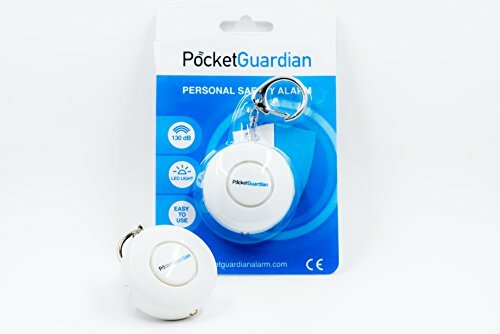 Simply tug on the Pocket Guardian to pull the pin out in case of emergency. Built in LED light. Press and hold the button with the lightbulb symbol to use! Comes with 3 AG13/LR44 batteries for extended life! The alarm will sound for a continuous 20-30 minutes on a new battery. If not in use, the battery has a 365 day standby time. 100% Satisfaction Guaranteed! If you are unhappy with your device for any reason, contact us for a full refund. At 130 dB, Pocket Guardian is loud. It can be activated in two ways. First, by pulling out the pin, which is connected to the keychain. The alarm will continue until you reinsert the pin. Second, by pressing the small button on the side with the alarm symbol. The keyring can be attached to your purse or backpack strap, making it easily accessible. Simply tug on the Pocket Guardian to pull the pin out in case of emergency. Built in LED light. Press and hold the button with the lightbulb symbol to use! Comes with 3 AG13/LR44 batteries for extended life! The alarm will sound for a continuous 20-30 minutes on a new battery. If not in use, the battery has a 365 day standby time. 100% Satisfaction Guaranteed! If you are unhappy with your device for any reason, contact us for a full refund. If you have any questions about this product by Z9 Brands, contact us by completing and submitting the form below. If you are looking for a specif part number, please include it with your message.